Congresswoman Lois Capps is collaborating with several local and state officials to discuss action taking place in response to the May Isla Vista shooting and stabbing rampage that left seven college students dead. Capps is hosting a press conference at 11 a.m. Monday at Walter Capps Park in Isla Vista. Attendees will include State Senator Hannah-Beth Jackson, Assemblyman Das Williams and Santa Barbara County Supervisor Dorreen Farr and District Attorney Joyce Dudley. UCSB student representatives will also participate. Both Capps and Jackson have introduced new gun control bills in response to May’s rampage. Will a member of the SB Sheriff’s office also be there? Perhaps they can explain why they didn’t bother to watch the killer’s threatening youtube videos until AFTER the massacre. With four months to go to the election, Capps runs about getting her photo ops, screeching about guns, but if she cared about guns she’d be concerned with the guns she voted for [ https://www.govtrack.us/congress/votes/113-2014/h114 ], currently being used by eastern European Nazis, supported by US-based mercenaries, each being paid up to $540,000 per year of our tax dollars, to commit unconcealed genocide against the civilian populations of southeast Ukraine. These vicious Nazis are direct descendants of the 14th SS-Volunteer Division “Galician” that, during World War II, was characterized as “the Nazis even Hitler was afraid of.” They are now using all means at their disposal — heavy MLRS systems, howitzers, mortars, tanks, and APCs — to deliberately target homes and apartment buildings, as well as essential civilian infrastructure such as power and water treatment plants. They’ve deliberately destroyed hospitals and at least one orphanage. They’ve reduced entire towns and villages to rubble, terrifying, starving, and expelling civilians. Thousands have been killed, multiples more maimed, 300,000 to 500,000 to date driven from their homes. Reports of atrocities are rising: mass rapes and murders, some committed by dismembering live civilians. The US-installed Kiev junta is now closing escape routes, repeatedly refusing to open humanitarian corridors, and deliberately attacking busloads of women and children attempting to escape to safety in western Russia. a golden dawn in Greece. Wow! Not only do you segue into a different topic but you use it to spread propaganda for the Russians and the faction they support. No doubt their have been a few atrocities by the Ukrainians — just as there have been a few by the Russian-associated rebels. It is an unfortunate consequence of armed conflicts. I am not sure how far I want us to be involved in that affair, but I do know that it was corruption that caused the overthrow of the Putin puppet that ran Ukraine. Strident, one-sided accusations by both sides also created more conflict than was necessary and I suspect that the Russians were more prominent in initiating it. Rather than reply indivdually to every gun nut that has already posted, I will address this gang…this cult…collectively here. The Second Amendment was an AFTERTHOUGHT.. That’s why it’s an amendment, an addenda to the original Constitution. The Second Amendment is not absolute, the be-all and end-all. To provide for organising, arming, and disciplining, the Militia, and for governing such Part of them as may be employed in the Service of the United States, reserving to the States respectively, the Appointment of the Officers, and the Authority, of training the Militia according to the discipline prescribed by Congress “. THAT is to who the 2nd Amendment applies ! It is collective, organized, trained, governed, disciplined. The gun nuts are against all of this. You want to carry a firearm in public? Sign up for the National Guard and be under their rules, authority, discipline, and governance. The gun nuts corrupt and abuse the 2nd Amendment ( only ) as a blanket ‘right’ for UNdisciplined individuals to be laws unto themselves. I join with the People and the framers for civilisation and reason; and against the gun lobby and their stooges with their lies and threats. The second amendment is “an AFTERTHOUGHT?” Well I suppose that you could interpret it that way — along with the other 9 amendments in the Bill of Rights. Tell me, do you consider the first, fourth and fifth amendments as “lesser” because they were tacked on too? Are you aware that the entire Bill of Rights was added to the Constitution BEFORE it was approved because without those amendments, it would not have been accepted by all those founding fathers who had an abiding concern that an oppressive government, should it gain office, needed restraints. There are ample quotes from people like Benjamin Franklin, Thomas Jefferson, Thomas Paine and others about the absolute need to restrain government — including by use of arms if necessary. If you don’t like that point of view, I suggest that you try to incorporate yours via the Constitutional Amendment process. Good luck, you’ll need a lot of it. By the way, the Supreme Court has ruled that the Second Amendment does apply to all citizens not reasonably prohibited and that the “well-armed militia” clause is but one rationale for it. Your interpretation does not have any legal weight until you can convince that body or judges to agree. Must you go popping his ideological bubble? Some people really are not comfortable thinking “outside the box” as it were. Twice in the last 6 years the Supreme Court of the United States has ruled that the 2nd Amendment enumerates the Civil Rights to Keep and Bear Arms for the purpose of self defense. Not sure why you are so anti Civil Rights, but the 1st Amendment protects your Civil Right to speak out. Now, if the left was as tolerant of others’ Civil Rights as they purport themselves to be…. rights are for the living, we extend these rights to others and we are civilized. this is proper. they are objects, tools that let people have their way . not a partisan issue, a consumer issue. not many civilized folk are comfortable with you walking around downtown displaying them. keep it private at home, no one is really interested in your gun . We accept the following statement as self-evident: “You don’t let children play with matches”. Now…translate ‘children’ as immature, irresponsible, violent, mentally unstable people. Translate ‘play’ as handle, carry, use, have access to. Translate ‘matches’ as guns, or other tools, objects, machines that can be dangerous and even deadly if mishandled. Simply put, the gun nuts let children play with matches. Oh, they make all kinds of specious claims with false and furious rhetoric; but then their behavior leaves matches lying around all over the place with open and easy availability for anyone to use…or abuse. The 2nd Amendment begins: “A well regulated Militia, being necessary to the security of a free State …”. Everything else follows. That is the premise. So now we look at what the Constitution says about ‘the Militia’ earlier, and the Framers described what the Militia is and how it is supposed to function. The gun nuts conveniently ignore this, just as they would ignore children playing with matches. When you type “…immature, irresponsible, violent, mentally unstable people.” I have to wonder if you’re psychologically projecting? That one sentence says some alarming things about its author. Exactly what part of “…the right of the people to keep and bear arms shall not be infringed.” do you not understand? Perhaps if you admitted your ignorance we could explain to you that which you do not understand? You’re wrong. I have an inalienable right to keep and bear firearms that is guaranteed to me by the Second Amendment no matter how some gun-banners torture and twist the language. I have absolutely no desire to display the firearm I carry concealed. I would lose a tactical advantage if I did so. Notice how you offered the false dichotomy of either keep guns at home OR walking around with them visible — no mention of licensed concealed carry? Perhaps that’s why people like you are taken very seriously by people like me? You ending Clive Bundy diatribe was nonsensical — quite literally. In all sincerity do you really think you can sell people your bull manure? I sense frustration in your writing (ex. using the invective “gun nuts”) so I’ve come to wonder if you truly believe that which you spew? Your notion that the Second Amendment was an “afterthought” is simply stultified. Even if it wan “afterthought”, it wouldn’t lesson its importance nor its authority. Exactly what part of “…the right of the people to keep and bear arms shall not be infringed.” do you not understand? In the end if people like you weren’t cowards (intellectually and otherwise) you would actually try to repeal the Second Amendment. You would fail of course (“the People” would not support you), but at least your actions would be honorable. Very unlike your feckless attempts to ban guns by standing on the graves of those who lost their lives in part due to the septic politics favored by people such as yourself. You and your ilk will continue to lose, thanks be to God. Tell you what Capps, let’s start by scrapping all the CA gun laws that have proven to be worthless based upon years of hard data and thorough analysis by independent and respected organizations. What? We can’t do any of those? The political (rather than public safety) implications would be too great? Then to hell with you! Expect the fight to continue for every inch of the liberty people like you are trying to take from us. Lois says, “We have joined together in a powerful way to say that not one more act should be tolerated”. Does she think there are people out there who tolerate this? No one tolerates this act. The only question is, will people tolerate the proposed “solution”? What we need are solutions that actually move toward solving the “problem”. Not politically correct “solutions” that are meant to meet a different hidden agenda. As some have pointed out, California already has strict laws that the shooter followed. Chicago has some of the toughest laws, but one of the highest gun related crimes. If it’s gun more gun control that Lois will propose, then how about more car control? In 1991 a UCSB student drove his car into five pedestrians and killed four of them. LOIS, stop proposing “solutions” that wont solve the problem. Don’t you get it? Aren’t you trying more of what’s not working? More gun control laws in California defy logic, unless your goal is to outlaw guns by means of the back door. Because, the front door is closed by the Constitution! What a brown nosing hack, how about doing something about drunken killers on the road. Federal data shows a 2009 total of 31,236 firearm-related deaths nationwide, approximately a rate retained for 2010 while there were 36,361 motor vehicle-related deaths in 2009. Centers for Disease Control and Prevention (CDC) reports 11,101 gang-related homicides using firearms in 2011 and 11,078 in 2010, meaning that about 1/3rd of gun-related deaths are caused by gangs, and half related to drug-turf wars. The FBI reports there were 8,583 gun related murders during 2011, about ¼th of all gun related deaths. Chicago has the most gun control of any US city, as Chicago gun deaths in the last two years have reached 435 and counting, surpassing 402 troop deaths in Afghanistan for 2012. AP reports that so far this year there have been 154 suicides among active-duty troops, a rate of nearly one each day. Also worth noting- over the July 4 weekend in Chicago, a total of 82 people were shot and 14 killed. 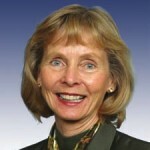 Congresswoman Capps , thank you for responding to the needs and pain of others. Amazing that technology has gotten so good that we almost can not see the strings the democratic party is using to control her as she speaks.